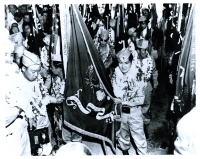 The 100th Infantry Battalion was officially deactivated in Honolulu on August 15, 1946, a little more than four years after the Hawaiian Provisional Battalion had left Honolulu and arrived in Oakland, California where it had been designated the 100th Infantry Battalion (Separate). In Hawaii, many men went back to their old jobs or learned new trades. Some of the big corporations offered executive positions to AJA officers such as Mitsuyoshi Fukuda who joined one of the Big Five companies, Castle and Cooke. Some veterans remembered difficulty in getting re-established and being turned down when applying for loans to start a small business. Others took advantage of the G.I. Bill and attended university or pursued graduate degrees, steadily increasing the number of Americans of Japanese Ancestry in professional and executive positions. About two hundred 100th veterans stayed in the Army. Those with knowledge of the Japanese language served in the Military Intelligence Service and as interpreters during the post war occupation of Japan. Young Oak Kim, who rose to the rank of colonel during the Korean War, became the first Asian American to command a battalion in combat. Hershey Miyamura, a 100th veteran from New Mexico, also served in the Korean War and spent over two years in a prisoner of war camp. After his release, Miyamura was awarded the Medal of Honor for his actions in combat just before he was captured. Seven men who had served with the 100th were killed in action in Korea. 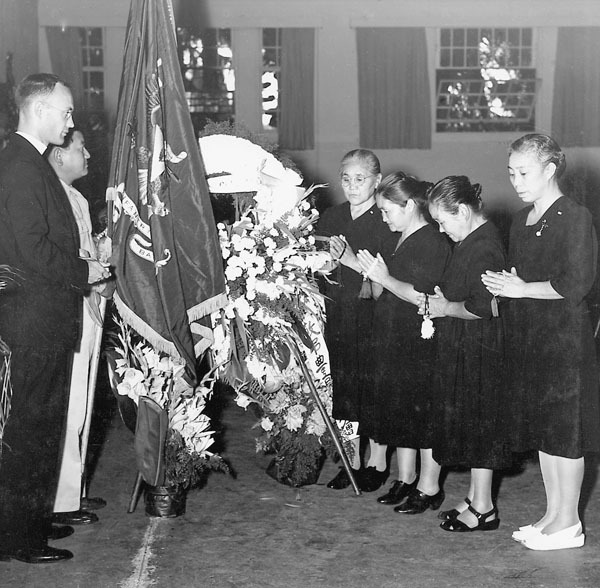 Others joined the Hawaii National Guard. Francis Takemoto became the first Japanese American to achieve the rank of Brigadier General. Edward Yoshimasu also rose to the rank of Brigadier General and succeeded General Takemoto. Conrad Tsukayama achieved the rank of Lieutenant Colonel. The veterans who were returning to families on the mainland faced an entirely different situation. While some families by this time had left the internment camps, others stayed until their sons returned to help them move and rebuild their lives. Many families from the western states who had lost their homes and livelihood settled in the midwest and eastern United States where they found more acceptance. Those who returned to the west coast often faced incidents of violence and discrimination, even though the War Relocation Authority (WRA) had initiated a campaign to publicize the combat record of the 100th and 442nd as part of an effort to help resettled the families leaving the camps. Throughout the country, veterans from other army units spoke up in support, sending letters to newspapers about their combat experiences with the AJA soldiers. Captain George Grandstaff of the 100th wrote to the WRA and was given permission to go on a tour in his home state of California to speak about the actions of people trying to keep Japanese families from returning to their homes. The soldiers who had died in action were not forgotten by those who had survived the war. After Colonel Turner returned to the islands, he visited families of the men who had been killed or wounded and spoke to groups, with the help of an interpreter, about the 100th’s training and combat records. 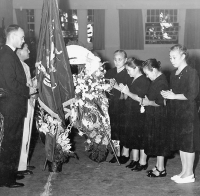 In September 1947, the battalion’s chaplain Israel Yost traveled from his home in Pennsylvania to conduct the annual memorial services on all the major islands. A year later, the remains of 79 soldiers from Hawaii returned from overseas cemeteries. Veterans met the ship when it docked in Honolulu Harbor. Immigrants of Japanese ancestry had been barred from applying for U.S. citizenship. Seven years after the end of the war, Congress passed the McCarran-Walter Act which eliminated racial restrictions found in previous immigration and naturalization laws, although quota systems remained in place based on national origins. Issei (Japanese for first generation) parents of the veterans were now able to become citizens. In the territory of Hawaii, the Republican Party had been the predominant political party for decades. A police captain who had worked closely with military and government officials before and after the attack on Pearl Harbor to minimize acts harmful to the Japanese residents, John Burns encouraged the AJAs to enter politics as an avenue to first class citizenship. He organized a coalition of various groups, including labor and the AJA veterans, resulting in the Democratic takeover of the Territory’s Legislature. In the ensuing years, Americans of Japanese Ancestry would continue to be a strong presence in Hawaii’s Democratic party, initiating reforms in a multitude of areas including comprehensive health insurance, expanded collective bargaining and environmental protection. Howard Miyake and Robert Taira worked for many years in the State Legislature, as did Yasutaka Fukushima who served in both the House and Senate before being appointed to the Circuit Court. Jack Mizuha, one of the battalion’s original officers, served in the State Supreme Court. Others veterans who were judges in district or circuit courts were Kenneth Saruwatari, Ben Takayesu, Kenneth Harada, Albert Oki, Toshimi Sodetani, Takashi Kitaoka, and Toshio Kabutan. During John Burns’ tenure (1962 – 1974) as governor, he appointed Dr. Kenneth Otagaki, Dr. Katsumi Kometani and Mike Tokunaga to cabinet positions.